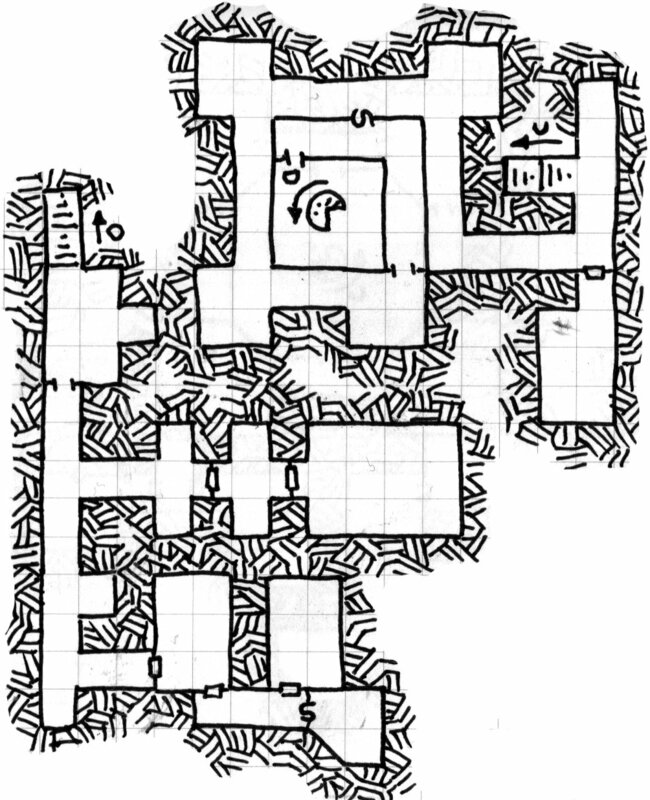 It’s been a long week, but I’ve got level 6 done of the Delve – available as usual as either just the map or as a One Page Dungeon stocked for classic B/X Dungeons & Dragons. What is immediately different about this level is that it is made of two distinct areas that are not connected on this level. In fact, the dungeon section to the lower-left is only accessible from level 7 of the dungeon. The area that the party will first discover (coming down from above) is a section of the dungeon that has been taken over by the adventurers / mercenaries / explorers from the temple deeper in the dungeon. The exact nature of the temple is left to the DM, but obviously should be an organization that will have no qualms killing off the PCs as they expand their control of the dungeon. The other section is still abandoned (like the majority of level 5), and is an old prison of a creature that is cursed to only die a violent death, and thus has been imprisoned here for quite some time. You can download the One Page Dungeon PDF here. Or you can click on the picture below to get a high resolution scan of the unkeyed map. THANKS once again for the great map! I have been following (and downloading) the “Dyson’s Delve” series avidly — it’s my first stop on Fridays! This is awesome. Last weekend I ran a friend (who was running a single PC with a bunch of hirelings) through more-or-less the entirety of levels 1-4. Brilliant dungeon. I’m really loving this dungeon and can’t wait to run it soon. Do you know how deep you’re going to make it? Jarrah – any tips or advice on running it? It seems pretty straightforward but I might be missing something. It is 11 levels at this point, and will stop there – with the option to be expanded because level 11 includes an underground lake to link to other “underdark” style adventures. Really my only tip is that you should read the levels thoroughly before playing. I just skimmed before running it, which worked fine, except for one level where each of the rooms shared one feature (alcoves with skeletal remains and treasure), which was only mentioned in the first entry. Wouldn’t have been a problem, except the party came to that level by the “back” way and did all the rooms in reverse. Hate to nit-pick such a beautiful map and level, but isn’t a design for 3rd level adventurerers a bit wimpy for 6th level. I am not sure about Labyrinth Lord, but OD&D 6th level was pretty deep more suited to high level characters. Perhaps I’ll just think of this as level 2c. These dungeons are designed at roughly 2 dungeon levels per character level. This is because each level is so small geographically. If level 6 was for level 6 characters, then I would need to put the stuff in levels 1-5 to bring the characters up to level 6. That would be a metric truck load of bad guys and treasure for such a small space. The full 11 levels of the Delve will bring a party up to roughly level 6. So if you insist on thinking of it in character level terms, then let’s go with it being a 5 level dungeon with many many sublevels. No problem with you running your dungeons your way. When I was DMing my second edition campaign I drew up lots of mini-dungeons usually 3-4 levels (because 1 level is just boring) but the monsters assigned to them were whatever level the party needed to battle. Just make sure your party understands the rules and are not scared off from going to the six level because they think it will be too tough. One great advantage of the OD&D level concept is that the player characters could choose their level of challenge by picking which level to be on. Of course us DMs were forever making life interesting with traps, chutes, and teleports to take players deeper than they had intended. I just discovered your site today and love it! For some reason everytime I try to download one of the “one page PDF” files it creates a problem with internet explorer. I’m not very computer savy, any ideas why? No clue. Have you tried right-clicking and “save as”? Session 3 of our game using Dyson’s Delve is Wednesday (Dec. 1) and I’m looking forward to exploring Level 2 further and getting even deeper into the Delve.